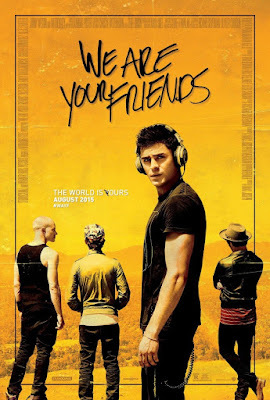 I went in fairly blind to see We Are Your Friends - I think I had seen the teaser trailer, and had a vague idea of what it was about and who was starring in it, but that was about all I knew. I actually ended up enjoying the film a lot, and it will appeal to millennials more so than the older demographic. Cole (Zac Efron) lives in his friend's guest house, next to a swimming pool that has no water in it. His goal in life is to be a professional DJ, and he and his friends have a regular Thursday gig where they bring people in to a club, and he gets to DJ in a side room. When he meets James (Wes Bentley, aka Seneca Crane), a world-known DJ, however, he gets a taste of what life could be like once he becomes famous, and he likes it. He also really likes James' girlfriend, Sophie (Emily Ratajkowski), who is more Cole's age than James's. Cole must decide whether to act on his attraction to Sophie, knowing that the choice he makes will affect his relationship with James, and could jeopardize any chances of travel and stardom as a famous DJ. The cast in this movie worked very well together; Efron and his three guy friends (Jonny Weston, Shiloh Fernandez, and Alex Shaffer) had good chemistry. Wes Bentley was great as James, a 40-ish DJ who (as Cole opines) has "sold out" in order to make a living off his DJing. Ratajkowski and Efron have great chemistry as well - their relationship is very believable - and Jon Bernthal (The Walking Dead) has a small role as a sleazeball real estate "investor" for whom Efron and his buddies start working. Yes, see this movie, though I'll warn you that you will most likely either love it or hate it: friends who went to the same screening as I did had a mix of opinions on it. Because I love music, and also "slick" movies, I loved this one, which was definitely a surprise to me; the film isn't one you'll be thinking about days after the final credits roll, but it's definitely one that is highly entertaining while you are watching it. I don't think I've ever seen a movie about a disc jockey (DJ) trying to make it in L.A., either, which makes this film an original, and it's the most fun I've had at the movies this summer, despite the abundance of "popcorn movies" that were supposedly going to be so popular at the theaters. We Are Your Friends is in theaters today, August 28th, and is rated R with a runtime of 96 minutes. 4 stars out of 5.